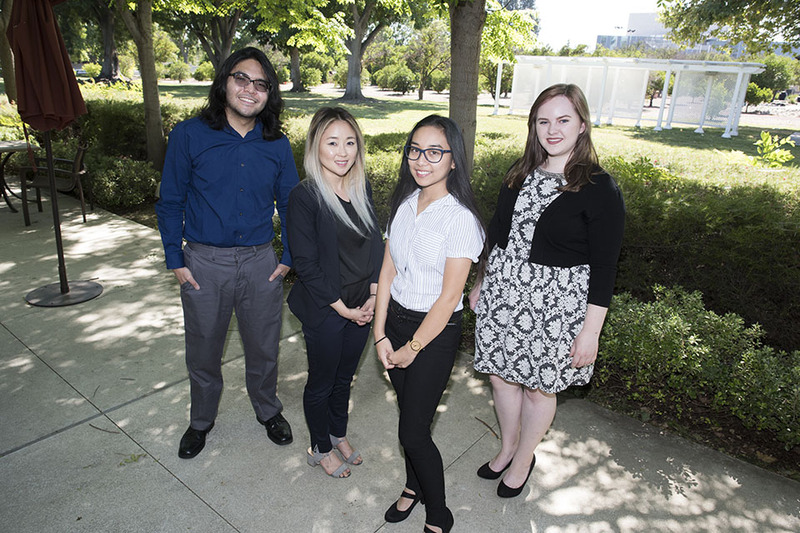 This year's Presidential Scholars Tyler Pugeda, Sa La Kim, Allea Cauilan and Kaitlyn Amodeo present at the annual Presidential Scholars Exhibit on May 2. The culmination of intense hard work and research was put on full display by some of California State University, Northridge’s brightest student researchers at the 2017 Presidential Scholars Exhibit on May 2 at the Orange Grove Bistro. The annual event featured presentations from the 2016-17 Presidential Scholarship recipients, a prestigious scholarship that gives undergraduate students the opportunity to work with faculty mentors in order to develop, complete and present an outlined research project each year at the annual exhibit. This year’s scholars included Tyler Pugeda (mathematics), Sa La Kim (biology), Kaitlyn Amodeo (geophysics) and Allea Cauilan (cell and molecular biology). For biology major Kim, her research project on the properties and role of integrin alpha 1 — which is a cell surface receptor for collagen found in pancreatic cancer — has been a three-and-a-half year journey. “The whole process [of working on the project] was hard at first, but it was something I got used to and really enjoyed,” Kim said. Kim’s mentor, biology professor Jonathan Kelber credits her for being a natural overachiever and stated that Kim worked on the project as a volunteer for one-and-a-half years. In order to get a taste for what’s to come in the near future, the 2017-18 Presidential Scholars were also in attendance during the exhibit. Sharing in the excitement was Vidal, who has been a part of the scholarship program since its inception in 2005.